“The U.S. Fish and Wildlife Service made our New Year happy today by announcing the listing of the Black Warrior waterdog as Endangered under the Endangered Species Act. The Black Warrior waterdog (Necturus alabamensis) is a rare aquatic salamander found in Alabama’s Black Warrior River basin and nowhere else in the world. Proposed for listing in October 2016, this action means the Service will work with other agencies to conserve and protect the waterdog when federal actions that may affect them are considered or undertaken. The Service also finalized the designation of critical habitat for the waterdog today. Critical habitat is defined as those specific geographic areas that contain features essential to the conservation of an endangered or threatened species and that may require special management and protection by the Service. When an area is designated as critical habitat, federal agencies are required by law to ensure that any action they fund, authorize or carry out is not likely to result in the destruction or adverse modification of the habitat. Originally, the Service proposed to designate 669 river miles within eleven tributaries of the Black Warrior River basin as critical habitat. Unfortunately, the Service’s announcement today cuts that proposed habitat by a third. The Service designated 420 river miles of critical habitat, comprised of five tributaries within the Black Warrior River basin; Sipsey Fork (Lawrence and Winston counties); Locust Fork (Blount, Etowah, Jefferson, and Marshall counties); Blackwater Creek (Walker and Winston counties); and Yellow Creek (Tuscaloosa County). While we are disappointed that the waterdog’s habitat was not fully protected as first proposed, we are pleased with the listing of the waterdog as Endangered and the designation of critical habitat for this imperiled species. We are proud that Black Warrior Riverkeeper Nelson Brooke was entrusted with Peer Reviewer status for both the Black Warrior waterdog’s proposed listing as well as the proposed critical habitat designation.” -Eva Dillard, staff attorney, Black Warrior Riverkeeper. The Black Warrior waterdog, a large aquatic salamander found only in the Black Warrior River Basin in Alabama, is now a federally protected species. The U.S. Fish and Wildlife Service (Service) listed the salamander as an endangered species under the Endangered Species Act (ESA), meaning it is in danger of extinction throughout all or a significant portion of its range. A rigorous review of the best available science has found low and declining population numbers due to loss and fragmentation of its habitat and poor water quality in the Black Warrior River Basin. The highly permeable skin and external gills of the waterdog make it particularly sensitive to declines in water quality and oxygen concentration. The Service is also finalizing critical habitat for the Black Warrior waterdog. We are designating 420 river miles of critical habitat in four units, including 127 miles of habitat already designated for other federally protected fish, mussels and salamanders. The designation includes only areas currently occupied by the species and will protect more than 50 percent of the waterdog’s historical habitat. The designation is comprised of five tributaries within the Black Warrior River Basin; Sipsey Fork (Lawrence and Winston Counties); Locust Fork (Blount, Etowah, Jefferson, and Marshall Counties); Blackwater Creek (Walker and Winston Counties); and Yellow Creek (Tuscaloosa County). The critical habitat designation should have minimal or no impact on the forestry and coal mining community. Since there are already critical habitat designations for other species in this area, very little additional regulatory action will be necessary for the waterdog. The designation will also have no impact on private landowners taking actions on their land that do not require federal funding or permits. Establishing critical habitat will raise awareness of the needs of the waterdog and other imperiled species and focus the efforts of our conservation partners. It also alerts federal agencies that they are required to make special conservation efforts when they work, fund or permit activities in those areas. The Black Warrior waterdog, known by its nickname, the Alabama mudpuppy, is a large, night-loving salamander that maintains its larval characteristics, including retention of external gills, throughout its life. It is found in streams within the main channel of the Black Warrior River and parts of the North River, Locust Fork, Mulberry Fork and Sipsey Fork. Sources of pollution in the Black Warrior River Basin include runoff from industrial plants, landfills, sewage treatment plants, construction, and the historical impacts of surface mining. 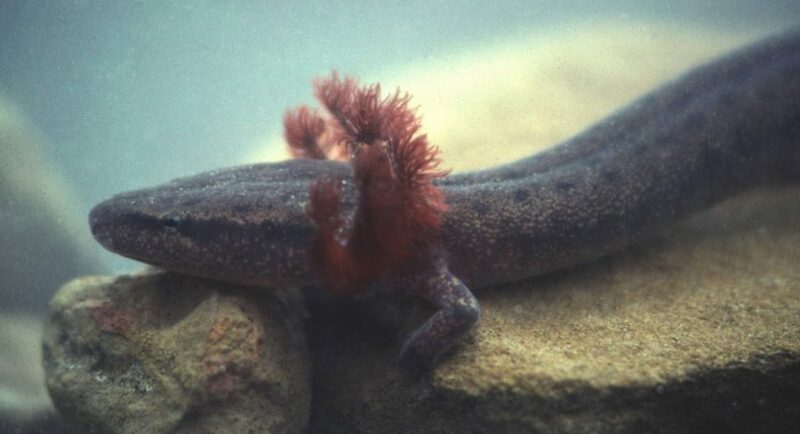 The Black Warrior waterdog is recognized as a Priority 2/High Conservation Concern by Alabama, meaning the state has been actively engaged with local and federal partners in understanding and addressing the impacts to the waterdog and other imperiled wildlife that share its habitat. There are 26 federally protected animals found in the Black Warrior River Basin, 15 of which are aquatic, including the flattened musk turtle. Consideration of the status of the waterdog was required under a court-approved litigation settlement agreement with two environmental groups. The complete listing and critical habitat rule, which becomes effective 30 days after publication in the Federal Register, can be obtained by visiting the Federal eRulemaking Portal: http://www.regulations.gov at Docket Number FWS–R4–ES–2016–0031. A copy can also be obtained by contacting U.S. Fish and Wildlife Service, 1208-B Main Street, Daphne, Alabama, 36526. The mission of the U.S. Fish and Wildlife Service is working with others to conserve, protect, and enhance fish, wildlife, plants, and their habitats for the continuing benefit of the American people. For more information on our work and the people who make it happen, visit www.fws.gov. Connect with our Facebook page at www.facebook.com/usfwssoutheast, follow our tweets at www.twitter.com/usfwssoutheast, watch our YouTube Channel at http://www.youtube.com/usfws and download photos from our Flickr page at http://www.flickr.com/photos/usfwssoutheast. The Black Warrior waterdog. Photo by Black Warrior Riverkeeper Advisory Council member Mark Bailey.